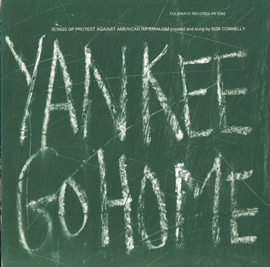 Album “Yankee Go Home: Songs of Protest Against American Imperialism”, Folkways Records. Cuba. The Rough Riders, reggimento di volontari dell’esercito statunitense, in posa dopo la battaglia di San Juan (1 luglio 1898). La canzone racconta di come alla fine dell’800 la stampa americana, in mano al magnate Hearst, fu il motore propulsore della guerra contro la Spagna per il controllo di Cuba e delle Filippine. Con la scusa “umanitaria”di voler sottrarre quei popoli alla ferocia dei dominatori spagnoli, il presidente McKinley ed il suo futuro successore, Theodore Roosevelt, in realtà non fecero altro che definire una volta per tutte il nascente imperialismo nord-americano. Ma non sarebbero riusciti ad avere l’opinione pubblica dalla loro parte senza le campagne di stampa di Hearst e di Joseph Pulitzer, l’altro “grande vecchio” dell’informazione a stelle e strisce dell’epoca. Of all the American imperialists of the 1890‘s, perhaps none is as famous as William Randolph Hearst, publisher and editor of the New York Journal. In the late l890's he found himself in a circulation war with Joseph Pulitzer's New York World, and both papers sent teams of reporters to Cuba to try to capitalize on the bloody insurrection which had started there. Both papers played up the atrocities of the Spanish and, in a not so subtle way, urged the intervention of American troops to free the suffering Cubans from the yoke of the Spanish Empire. Feelings for intervention had been strong throughout the United States. Many Christian ministers and many of the leaders of the Republican and Democratic parties argued for intervention on what they called "humanistic" terms: to help the cuban people free themselves from the savageness of the Spanish imperialist. They all disavowed any interest in annexing Cuba, or any other Spanish territory. Other Americans, like Theodore Roosevelt and Senator Henry Cabot Lodge, argued for war for the expressed purpose of territorial expansion and military glory. Together these two views for some type of intervention worked up a groundswell of war feeling in the United States. President Cleveland resisted the attempts at intervention as did his successor, President McKinley at the beginning of his administration. In fact, the Spanish government, in order to appease the war hawks in the United States, recalled the brutal Gen. Wayler from his post as Governor of Cuba and instituted a new government which gave promise of eventual self goverment for the Cuban people. But with the interception of a note from the Spanish ambassador to Washington in which he called President McKinley "weak and a bidder for the admiration from the crowd” […] and with the sudden and as yet still unexplained explosion which destroyed the battleship Maine in Havana Harbor, the jingoistic press of Hearst and his followers worked the spirit of the country to such a war frenzy, that no matter what the Spanish government would do, war was inevitable. Congress declared war on April 19, 1898, and within ten weeks the war was over. Who eventually have to fight them. Who plot and intrique to ignite them. We all know your name. You're the man to blame. So he put us on the go. And sunk the goodship, Maine. He made a whole lot more. 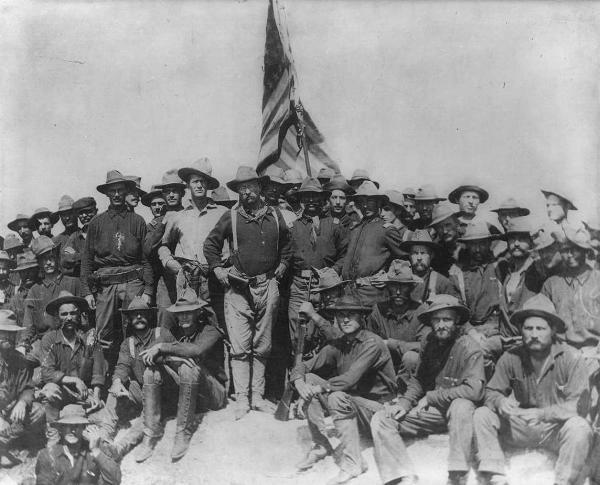 Ma lo sapete che il tipo con occhiali e baffoni al centro della foto dei Rough Riders a Cuba nel 1898 altri non è che il futuro presidente degli States Theodore Roosevelt?